Fintech is an all-encompassing term used to refer to technology in the financial services sector. Technology has long been a part of the financial services industry, but only recently has the term fintech emerged to cover all of the developments within the space. Fintech used to refer to the back-end technology used to run traditional financial services organizations, but has morphed into a term primarily used to describe disruptive financial technologies. Fintech investment ballooned from $1.89 billion in 2010, to $27 billion in 2017. 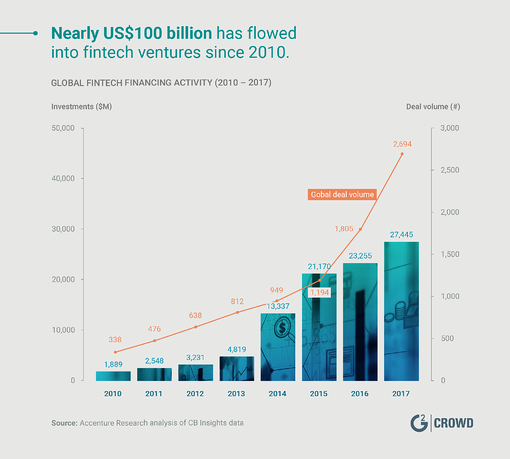 The increase in fintech spending is expected to continue, with the Asia/Pacific and African markets driving a significant share of market growth. The fintech umbrella includes insurance technology (insurtech), regulatory technology (regtech), financial data APIs, payments, banking, and mobile banking, among other types of technology. Each category represents a distinct category of finance-specific technology. The explosion of the internet and the mobile internet has catalyzed the rapid development of financial technology. Even lumbering, highly regulated and highly cautious industries (such as insurance) have begun to embrace the innovative opportunities for enhanced effectiveness offered by fintech solutions. Financial services institutions have warily kept fintech companies at arm’s length, seeing them as industry disruptors and potential competitors. Wisdom and self interest have triumphed over caution, it seems, as financial giants have started to invest in and partner with fintech companies. This newfound acceptance and promotion of fintech innovation, proven by the large amount of investment in the fintech industry, will accelerate the development and implementation of fintech throughout the financial services sector. Fintech applications offer the B2B space a host of potential benefits. While some fintech applications are consumer specific (personal finance applications for one), or directly benefit the consumer, the vast majority of solutions in the space are B2B focused. Businesses can always benefit from technology that provides more automation. In the regulatory technology industry, banks are primed to save billions of dollars per year by implementing regtech solutions. In addition to cutting down on the number of employees needed to carry out tasks that can be automated, the insights provided by fintech applications can streamline business operations and improve operating efficiency. This is one area in which fintech can help businesses immensely, particularly in light of the increased usage of AI in solutions. Businesses can now rely on AI-powered, data-driven insights to shape strategy. Armed with these insights, businesses can make better informed decisions about where to direct resources and how to target clients. One of the major benefits of fintech, specifically in regards to blockchain-based fintech and AI-powered regtech for the financial services industry, is the introduction of transparency. Fintech projects create auditable money trails and can help identify potentially fraudulent activity faster and more easily than a human. The transparency introduced by these projects will catalyze the evolution of the anti-money laundering (AML) and know your customer (KYC) portions of the industry. Because fintech is such an inclusive word, there are many subcategories that fall within its purview. Every financial services industry has been affected by the fintech revolution, from insurance and compliance to banking and payments. Fintech aims to make institutions more efficient and effective, provide consumers and businesses with more choices, increase transparency and cut down on the amount of time wasted during financial transactions. Insurance technology (insurtech) saw over $2 billion worth of investment in 2017, a solid endorsement of the value provided by solutions in this fintech subcategory. Insurtech has been slowly embraced by the insurance industry, a notoriously un-innovative industry. The strict regulations that govern the insurance industry have held back the development and implementation of insurance-specific applications. Now, however, insurance agencies have embraced the potential represented by insurance-specific solutions. The global insurance industry gross written premium (GWP), which is essentially the size of the industry, was $4.8 trillion in 2017. There is massive potential in the industry, and the influx of insurtech investment will continue as fintech companies look to capture some of that huge market. Regulatory technology (regtech) is technology that helps financial institutions meet financial compliance regulations. Regtech has seen an immense upsurge in popularity within the past few years, which is due in part to the rise of disruptive fintech products. Regulators have scrambled to shackle these new technologies to protective regulation, taking it upon themselves to codify strict data regulations in order to curtail data misuse by banks. Regtech spending is expected to reach $76 billion by 2022. The catalyst for this explosion in spending has been the increase in financial regulations, which has prompted banks and other financial institutions to ensure regulatory compliance to avoid massive fines. Since the global financial crisis in 2008, banks have been hit with $243 billion in fines. Banks are preemptively attempting to stave off these pernicious fines by investing in regtech, which eliminates the need for massive compliance teams and drives compliance. Financial data APIs are changing the way the financial services industry looks at banking and have bolstered the concept of open banking as a viable concept. Open banking refers to banks opening up their vast amounts of client data to help financial technology startups develop applications designed to help banking clients. Data anonymization is the key to the viability of open banking as a concept, as it means that data is cleansed of any personal information prior to being handed over. This ensures the protection of user privacy and allows companies to use these massive datasets to develop innovative solutions within the financial services space to the benefit of the entire industry. Regulators lead the drive for open banking, creating legislation designed to promote competition and consumer choice by catalyzing innovation in the sector. 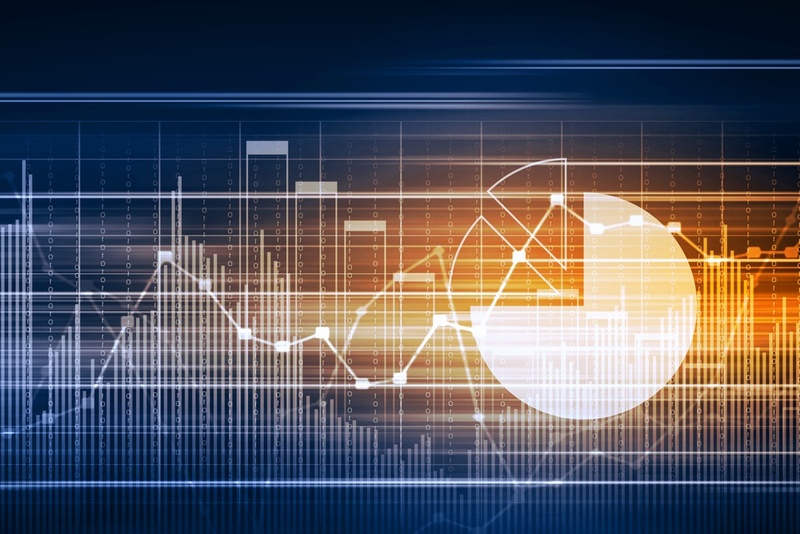 Financial data APIs are multifaceted tools that can be leveraged to provide value in a variety of ways, including connecting businesses to stock information. TIP: Learn how structured data enables AI in finance. Payments is such a massive subcategory within the fintech space it deserves its own article (which it will get, coming soon). The largest subcategory within the fintech space, payments has improved the ease with which people can do business. Payments solutions aim to cut down on transaction times between financial institutions, specifically within the international money transfer market, which has been the bane of many entrepreneurs’ existence. Small businesses, by using a payment gateway solutions such as Square, can now accept credit and debit cards, opening up a whole new range of potential customers who deign to use cash. Mobile payments in particular has become an increasingly important fintech category that is opening the door to financial inclusion for billions of people. Banking software has been around for quite some time but has seen rapid development in the past few years, specifically in the mobile banking sector. Mobile banking has driven financial inclusion for the 2 billion unbanked or underbanked, enabling these users to skip the step of banking with a brick-and-mortar institution. Mobile banking allows consumers to bank directly on their mobile devices. Lending technology has also developed rapidly within the fintech framework, offering businesses and consumers opportunities to borrow like never before. Lending and loan software improvements have also impacted traditional lending institutions by giving them tools to automate processes, cutting down on the time spent on unnecessarily redundant tasks. From loan origination to loan servicing, solutions in the lending category run the gamut and provide a breadth of functionality specifically for the lending industry. A prime example is peer-to-peer lending platforms. While these platforms often offer personal loans, they also offer business loans. The goal of peer-to-peer lending platforms is to lower the qualification barrier to getting loans. Businesses that would otherwise not qualify for a loan from a traditional financial institution have the opportunity to qualify for these. While blockchain is not unique to the financial services industry, it was in the industry in which it was first utilized. 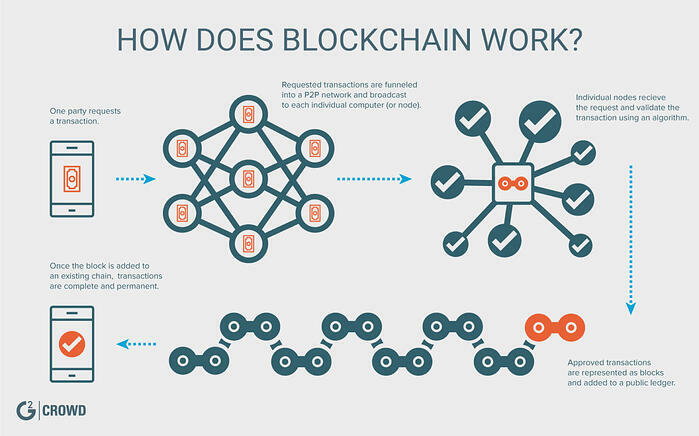 The premise of blockchain (here is a more in-depth blockchain explained resource) is that all data is housed in a distributed ledger, which ensures the veracity of the data housed there by cross-referencing it against all the other ledgers in existence. There are a variety of use cases for blockchain technology within the financial services industry. One estimate puts the potential time savings in just the banking industry at 5.4 million hours per year by 2022. While the regulatory powers that be are still working on instituting solid regulations, it looks as though blockchain technology in some form, be it public or private, is here to stay in the financial services industry. Our blockchain platforms category has dozens of products upon which fintech projects can be built. One blockchain application within the financial services sector is that of smart contracts. A smart contract utilizing blockchain technology validates, monitors, and enforces the terms of the contract automatically. This eliminates the need for legacy technologies in the financial contracts world and streamlines the entire contract process. TIP: For more information, read our piece on smart contracts and their applications. The next few years look to be bright for the fintech industry. Advances in artificial intelligence and data handling and analytics will drive even more innovation in the sector. Open banking practices and an increase in the number of financial data APIs will drive even more fintech application development. Blockchain projects have the potential to catalyze rapid evolution in the banking industry and beyond. We will continue to monitor developments in the fintech field as they occur. 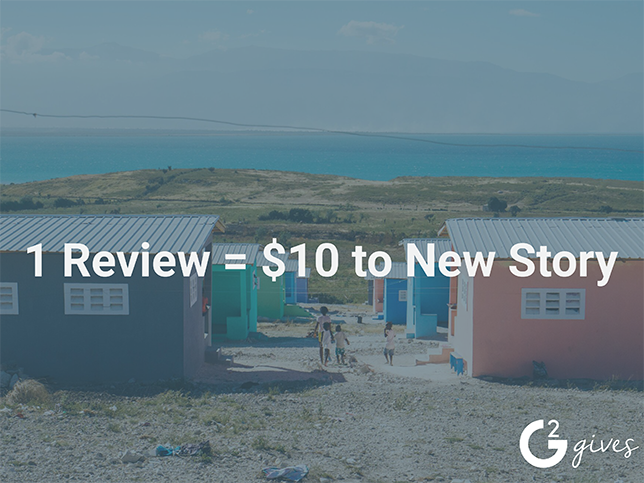 In the meantime, be on the lookout for some of our upcoming fintech pieces in which we flesh out a comprehensive vision of the current lay of the land and provide informed speculation as to what’s coming next. Ready to learn more about fintech in 2018? Learn about the best financial services to help your business.